The processed resin effused by the fruit of evergreen climbing shrub Daemonorops draco Bl. of family Palmae. Mainly in Indonesia, Malaysia and Iran, Guangdong and Taiwan provinces in China, mostly artificially raised. 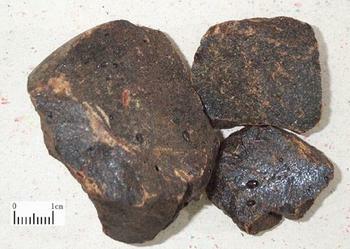 Iron-like black outside, blood-like red when ground into powder, chocking when burned with benzoic acid-like fragrance. Smashed into pieces or ground into thin powder. Sweet, salty, neutral; heart and liver meridians entered. Dispel stasis and alleviate pain, stop bleeding and promote tissue regeneration. This herb can dissolve blood stasis, dredge meridians and vessels, resolve swelling and alleviate pain served as a miraculous herb in treating swelling and pain due to stasis. For traumatic injuries and stagnant swelling and pain, it is usually combined with other stasis-resolving analgesics. For instance it is combined with Ru Xiang, Mo Yao and Er Cha in Qi Li San from Liang Fang Ji Ye (Collections of Useful Prescriptions). It can activate blood, dissolve stasis, dredge meridians and alleviate pain indicated for swelling and pain due to blood stasis obstruction such as pain of heart and abdomen, amenorrhea, dysmenorrhea, and postpartum abdominal stagnant pain. For instance it is usually combined with blood-activating and meridian-dredging analgesics such as San Qi, Chuan Xiong and Dan Shen. This herb can both dissolve stasis and stop bleeding with the hemostatic feature without retaining stasis. So it is indicated for the bleeding caused by stasis obstruction and failure of blood to circulate in vessels, especially to traumatic bleeding. It is made powder for external application singly or combined with stasis-resolving analgesics such as San Qi and Er Cha. This herb is good at activating blood and resolving swelling, removing stasis and necrotic tissue, promoting tissue regeneration and healing wound, stopping bleeding and alleviating pain. So it is indicated for ulcerated sore and abscess not healed for a long time. It can astringe the wound to promote healing, and prevent necrosis and protect wound. It is ground into powder for external application or combined with tissue-regenerating and wound-healing herbs such as Ru Xiang and Mo Yao. Mostly 1~2g in pill and powder for internal application. Ground into powder. Proper dose for external application.